If you own the TFV12 Prince Tank by Smok, you are most definitely going to want to get a hold of this three pack of replacement coils that are going to up your vaping game tenfold. They give you the opportunity to be able to take all of those great juices that you've been collecting and investing in a chance to really shine and will have you feeling like you are making the very most out of every single vape break that you take. Once you try vaping with these coils installed into your system, you are going to be repurchasing and using them for life. It's no wonder why they perform so well, they are made by the team over at Smok after all! Smok is a brand that is synonymous with quality and when you purchase anything that's been made by them, you are going to be adding in something that will become a true necessity that you will hold dear and immediately give holy grail status to. This three pack of V12 Prince X2 Coils features an extremely durable, exquisite quality, wire wound inside that allows for a much larger heating surface that in turn provides for a quick heating time. They also have a 0.4ohm resistance and can be ran between 60 and 140 watts, with their best range being between 90 and 100 watts. 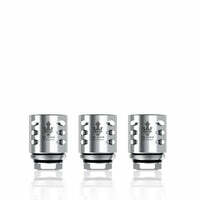 TFV12 Prince X2 Coils (3 Pack) - Smok has a rating of 4.6 stars based on 5 reviews.